My grandmother on my mother's side(all are english) had jet black hair! You can go to every corner of the British Isles and find people with all manner of hair colours. We're a very mixed nation. There are plenty of dark haired English, just as there are plenty of fair haired Welsh or Scottish with blue eyes. Not all English people look like Boris Johnson and not all Welsh look like Catherine Zeta Jones. But, I happen to believe, based on a lifetime's observation, and from all that I have read, that very dark brown or black hair is more of a Celtic trait than an English one. I think you could get many variations within a house hold even. There are eight in my family and we cover many variations; dark hair/blue eyes, dark hair/brown eyes, brown hair/blue eyes, brown hair/brown eyes, light hair/blue eyes and different skin coloring also. I read somewhere that a later PoBI map contained far more symbols/colour combinations than the one many of us have seen. The original Welsh orange was broken into two clusters in the country: one being light purple crosses; the other, light yellow. Both found in Dyfed. The light purple was also in north east Ireland & southern Scotland. Southern Scotland also had white triangles & light blue circles. That was a while ago, so it may be there are yet more combinations to be found on the final product. That's right. I have seen three different coloured maps for this project, the most detailed being the one posted by Brian Swann on facebook. These were photos taken of the live exhibition at the Royal Society this summer. It is worth rememberng that the clusters are autosomalDNA - the whole of a person's ancestry, not just male or female DNA lineages. The colours do not mean anything in particular. They just denote a particular genetic cluster. A cluster is a group of individuals that are more similar to each other genetically than to other individuals. There is no indication on this map as to how the clusters are related to each other. When we plot the individual samples on the map by the central position of where their grandparents were born, we get the map we have here. This shows a very high level of concordance of the distribution of the cluster with geography. The Cornish have similarity to the Welsh in that the Cornish and Welsh both have a high similarity to North West France. However, the Cornish are more genetically similar to mainland England than the Welsh. Probably one of the most surprising patterns was the clear distinction between Cornwall and Devon, virtually along the County border. We are still thinking about the patterns and how they might be related to history. One way to think about Cornwall, Devon and the rest of England is that Cornwall is more representative of the peopling of the British Isles from the Atlantic facing region of Europe, whilst the extensive red English cluster has a large signature from the Belgium/Denmark/North Germany area. Devon can then be thought of as a zone of mixture between the two. The tight boundaries are very interesting and may well be a result of political spheres of influence. Hi Stuart,The colours do not mean anything in particular. They just denote a particular genetic cluster. A cluster is a group of individuals that are more similar to each other genetically than to other individuals. There is no indication on this map as to how the clusters are related to each other. When we plot the individual samples on the map by the central position of where their grandparents were born, we get the map we have here. This shows a very high level of concordance of the distribution of the cluster with geography. That's interesting info, Avalon. The next few weeks are going to be fascinating, what with PoBI's report & King Richard's remains. I am also very interested in the discovery of King Richard III remaind. Does this mean he will finally get a full state funeral and internment in Westminster Abbey. My morning (British) newspaper claims he will be buried in Leicester Cathedral, Heber. I really hope they extract some Y-DNA, if possible. I don't think they realise the media coverage they'd benefit from with potential male descendants stepping forward - far more so than an mtDNA link. Evidently there are a number of SNPs on MC1R associated with red hair. I guess one can acquire that trait by being homozygous (with the right nucleotide) at any one of them. Perhaps it is the combination of them that determines the shade or degree of red? 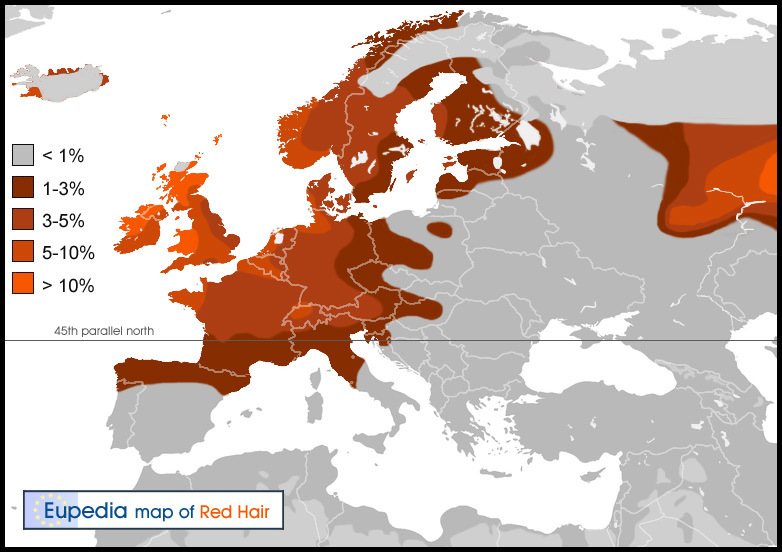 I stand by what I wrote elsewhere about Scandinavians and Germans not being known for an abundance of red hair. I have not read that Roryvik study mentioned earlier, so I don't know which SNP or SNPs associated with red hair it tested. I recall reading that different MC1R variants are responsible for red hair in different places, so comparing the POBI stats to Roryvik might be like comparing pumpkins to oranges (I tried to stick with an orange-colored simile). I suspect the MC1R variant tested by POBI was rs1805008, also known as R160W or Arg160Trp. I think one color/shape to represent certian regions is a bit too general, would a better approach be somethign liek a pie chard showing frequencies of components in regions? I think the colours just show that people within that cluster are genetically closer to each other than to other clusters. The geographic spread makes sense when you consider that POBI took rural samples where populations are usually more stable. My speculation on the clusters is simply based on what I know about the history of different regions in Britain. For instance, I have a personal interest in North Wales so I am not surprised to see a distinctive cluster there given what we know about the history. Although, I think Anglesey was over sampled in this project and Powys totally ignored. I would like to have seen more samples in Conwy and Gwynedd. "Happy Roodharigendag (that's Redhead Day in Dutch). It's a summer festival that takes place the first weekend in September in the Netherlands. This year, nearly 5,000 people gathered to celebrate all things fiery red, especially this unique phenotype." Here is an interesting article on red heads and genetics. Changing tack slightly, I wonder if the Welsh are under-represented on modern databases such as ftdna and ysearch? I mean, there is an obvious American interest in Ireland given the large scale Irish emigration in the 19th century. Before that you had the Scots-Irish/Borderers who left plenty of descendants in modern America. And of course the English were well represented in the early settlement of North America. In Scotland the Highland Clearances forced many Gaelic speakers to leave Scotland and emigrate to Canada, Australia and New Zealand and this can partly explain the decline in Scottish Gaelic. The Welsh however were different and did not emigrate to the same extent as other Isles based people. The Welsh largely stayed put and this partly explains the survival of the Welsh language compared to other Celtic countries. That's a good question. It seems to me there was quite a bit of Welsh emigration to North America, although I am not sure of the exact extent of it. I know the Welsh were an important element in the foundation and early settlement of the state of Pennsylvania, many of them settling in the so-called "Welsh Tract". The proportion of the population with a name of Welsh origin ranges from 9.5% in South Carolina to 1.1% in North Dakota. Typically names of Welsh origin are concentrated in the mid Atlantic states, the Carolinas, Georgia and Alabama and in Appalachia, West Virginia and Tennessee. By contrast there are relatively fewer Welsh names in New England, the northern mid West, and the South West. That's right. I'd read about the Welsh in Pennsylvania and the Welsh Quaker emigration due to persecution. Interesting thing about wikipedia is that African Americans seem to have a large proportion of Welsh surnames. I also think that some common Welsh surnames such as Jones, Williams, Thomas, Evans, etc have been in England for a long time. It's imperative to get more Welsh people testing, plus folk with a lineage strongly linked to the remoter parts of Cumbria & other western English counties. The Border clearances, plus earlier 'removal' of reiving families, has resulted in huge interest in DNA testing from those now in N. America, in particular. The annual Armstrong gather sees folk from all corners of the world meeting on the Borders. They are extremely keen on reconnecting with their ancient homeland. Due to the Irish records' fire, many have no possibility of tracing ancestors before the early 1800s. On the surface, it seems the Welsh are apathetic compared to the Irish, but I'd assume this is because the need to connect to their ancient homeland doesn't need bolstering as they live in it! PS Obviously there was Welsh emigration, but not to the same degree as Scots & irish. I'm not trying at all to inject politics into this thread, but Ann Romney, the wife of Republican presidential candidate Mitt Romney, was originally Ann Davies and is the daughter of a Welsh immigrant, Edward R. Davies, from Caerau. All good points. We also have recent y-DNA studies but for some reason Anglesey is often sampled for North Wales. That's fine, but I would like to see more sampling from other parts of Wales. As for the databases, there is a greater American interest in DNA testing which is why we see more Irish, Scottish and English references. "Mitochondrial DNA tests are about to be carried out on the skeleton, unearthed by a team from Leicester University and the Richard III Society. If the remains prove to be those of the long lost monarch, the next question will be: what to do with them?" I asked the POBI team when we could expect to see the detailed paper and got the following reply. That means we should get the Geno 2.0 report first. Two detailed reports just in time for Christmas. Great. "Many thanks for your interest in our project. I'm afraid that I don't have a date for publication at the moment. We are in the process of sorting out some final analyses before we submit the paper but once it has been accepted and is available, we will put a copy up on our website. My guess is that it will be a couple of months at least." That's disappointing, Heber. However, thanks for the info. I wonder if they've realised justy how complex the analysis of British Isles DNA can be? Seventh of November is the date of the ASHG conference. This event is like a candy store of interesting papers. I look forward to the new Ancestry Painting 2.0 from 23andme with 20 reference populations and will be interested to see the European reference populations they use. We appear to be entering into a new era of population genetics. The POBI paper will be presented in the same conference. This is a follow up from the Summer exhibition in the Royal Academy. Hopefully this time we will get the detailed Genetic Atlas of Britain. I am participating in the Irish DNA Atlas project so I will be interested in eventually comparing results when that study is published. What is interesting is they have compared the results to reference European populations. Which populations remains to be seen. "Thus we can observe the relative contribution (under our model) of each of these European populations to the genomes of samples in different regions of Britain." People of the British Isles: An analysis of the genetic contributions of European populations to a UK control population. S. Leslie1, B. Winney2, G. Hellenthal3, S. Myers4, P. Donnelly3, W. Bodmer2 1) Statistical Genetics, Murdoch Childrens Research Institute, Melbourne, Australia; 2) Department of Oncology, University of Oxford, UK; 3) The Wellcome Trust Centre for Human Genetics, University of Oxford, UK; 4) Department of Statistics, University of Oxford, UK. There is much interest in fine scale population structure in the UK, as a signature of historical migration events and because of the effect population structure may have on disease association studies. Population structure appears to have a minor impact on the current generation of genome-wide association studies, but will probably be important for the next generation of studies seeking associations to rare variants. Furthermore there is great interest in understanding where the British people came from. Thus far genetic studies have been limited to a small number of markers or to samples not collected to specifically address these questions. A natural method for understanding population structure is to control and document carefully the provenance of samples. We describe the collection of a cohort of rural UK samples (The People of the British Isles), aimed at providing a well-characterised UK control population. This will be a resource for research community as well as providing fine-scale genetic information on the history of the British. Using a novel clustering algorithm, approximately 2000 samples were clustered purely as a function of genetic similarity, without reference to their known sampling locations. When each individual is plotted on a UK map, there is a striking association between inferred clusters and geography, reflecting to a major extent the known history of the British peoples. A similar analysis is performed on samples from different parts of Europe. Using the European samples as ‘source populations’ we apply a novel algorithm to determine the proportion of the genomes within each of the derived British clusters that are most closely related to each of the source populations. Thus we can observe the relative contribution (under our model) of each of these European populations to the genomes of samples in different regions of Britain. Our results strikingly reflect much of the known historical and archaeological record while raising some important questions and perhaps answering others. We believe this is the first detailed analysis of very fine-scale genetic structure and its origin in a population of very similar humans. This has been achieved through both a careful sampling strategy and an approach to analysis that accounts for linkage disequilibrium. Whatever you think of the article, the map itself is pretty good. I'm surprised a little at the extent of it on the continent. Some of it is tantalizing though as now it best matches Celtic speakers, what do you think the situation would have looked like 2,000 or 3,000 years ago? Could have been greater for the simple reason that people lived in tribes and there may have been a far higher chance of both parents carrying the gene! I like the map, but the shading is counter intuitive. He has the lighter shades representing higher frequencies and the darker representing lower frequencies. It's usually the other way around. I'm posting it again with Image Shack so that you can click on it and see a larger image. I'm also posting Maciamo's L21 map for grins.